If you know someone who has recently become a new parent, choosing the perfect gift can be tough. The perfect gift is something they want or need, but might never get themselves. It is original, personal, and thoughtful. It shows that you truly know them. High quality kids dishware can be a great choice Most importantly, if it may come into contact with the newest member of their family, it has to be free of any chemicals or substances harmful to still developing children. Factor in affordability, and the perfect gift can be an elusive catch. But here’s the good news: the Kangovou Kids Dishware Set might just be the perfect gift you’ve been looking for. Read on to find out why. When was the last time someone surprised you with a gift that you actually really wanted or needed, but never would have purchased for yourself? These are often the best types of gift – the gifts that don’t just sit on a shelf. Kangovou Dishware Sets are the perfect gift for new parents because they are something parents will use every single day. Sets include every piece of dishware a parent could need for their child including plates, bowls, storage containers, silverware, and a spill-proof sippy cup. Kangovou Dishware Sets are made with high quality stainless steel, giving them an exceptionally lightweight and durable design that won’t show daily wear and tear. This makes it perfect for everyday use with children- whether they’re on-the-go, visiting grandparents, running errands with Mom or Dad, playing at a friend’s, or just enjoying family time at home. All Kangovou products are also top shelf dishwasher safe, and clean easily with just a bit of soap and water. New parents are blessed in many ways. Time, unfortunately, is not one of those ways. When a parent has the Kangovou Dishware Set for their child, they know that they won’t have to scramble around for the right dish or plate before running out the door, that their child’s food will be safely and hygienically stored, and that they won’t ever have to replace it. At the end of the day, it is just one less thing a parent has to think about – leaving more time for the things that don’t make them want to pull their hair out! The Kangovou Dishware Set also lets parents cut down on the clutter in their kitchen cabinets. With a full set, a parent has all the dishware and storage containers they need for breakfast, lunch, dinner, snacks, and everything in between. It’s color coordinated, easily storable, and will save them a lot money and time down the road! Kangovou products are made with high quality, food-grade, Type 304, 18/8 stainless steel. Why is this important for a new parent? Because it means this dishware is tough enough to withstand even the most brutal abuse a child can think up. Kangovou stainless steel does not chip, rust, or even stain, and is practically impossible to destroy. When a parent receives a Kangovou Dishware Set, they needn’t worry about dishware for their child for years. This is because each set includes all the materials necessary for the set to grow with their child- from bottle feeding in infancy to early foods like pureed veggies or baby cereal, and ultimately to solid food later on in the child’s development. Kangovou dishware can also be easily washed and used over and over again, making it a smart, economic choice. All Kangovou Dishware is made with stainless steel of the highest quality. This means that products are 100% recyclable, produced with no environmentally harmful by-products, and are free from harmful, plastic-based chemicals that can endanger a child early in development. The following are chemicals all parents should be aware of. BPA, or bisphenol-A, is an industrial chemical that has been used to make certain plastics and resins since the 1960’s. Some research has shown that BPA can seep into food or beverages from containers that are made with BPA. This is of concern because BPA has been shown to cause dangerous effects on the brains, behaviors, and prostate glands of infants and children, in particular. All Kangovou products are 100% BPA free. BPS is an industrial chemical that has been increasingly used as a substitute for BPA in many plastics as our awareness of the risks of BPA has grown. Early research shows that BPS is similarly dangerous to infants and embryos, particularly regarding neural cell and heart development. All Kangovou products are 100% BPS free. Lead has been used in the glazing process for ceramic dishes, bowls, pitchers, plates and other utensils for centuries. This lead can get into food and drink prepared, stored, or served with these ceramics. Lead is a toxic substance that can affect people of any age, but is especially harmful to children and pregnant women. All Kangovou products are 100% lead-free. Melamine is a common chemical component of plastic tableware that, in high enough concentrations, can put people at risk for kidney stones, kidney failure and even death. It has long been known that microwaving food in plastic containers with melamine is a big ‘no-no’, and a recent study casts doubt over whether melamine dishes are safe to use at all, microwave or no microwave. All Kangovou products are 100% melamine free. PVC, or poly-vinyl chlorida, is a synthetic resin commonly used in plastic products. The production of PVC results in the creation and discharge of several highly toxic chemicals that are dangerous to humans and the environment. Products made with PVC can leach phthalates and other chemicals into food or drink that are linked to diseases such as asthma and developmental problems in children. All Kangovou products are 100% PVC free. Phthalates are a family of chemical compounds that are used in nearly all plastics. Phthalates mimic hormones and, as they leach out of plastic containers, feminize babies and small children. This can lead to a variety of problems, including reproductive mutation and hypospadias, as well as planting the seeds for cancer that can develop later in life. All Kangovou products are 100% phthalate free. Kangovou Dishware is features a unique design and is available in four vibrant, distinctive colors, giving it an original and personal touch. Giving a dishware set as a gift signals that you thought not only about them, but about the health and well-being of their child as well. Nothing communicates thoughtfulness more strongly. Reason 6: It is Affordable – Now More Than Ever! 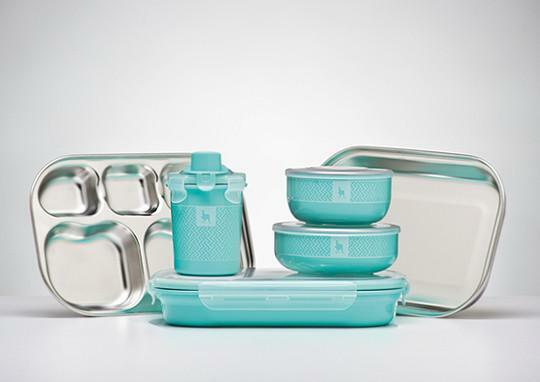 Kangovou Dishware Sets are always incredibly affordable at only $69.99 per set. That’s less than $70 for an entire set of excellent quality dishware that will grow with their child for years- never breaking or rusting, and easy to clean. But I have great news: starting on December 12th, Kangovou is offering great deals and discounts site-wide for their 12 Days of Christmas Sale, including free shipping on Dishware Sets. Each day is a new deal, but the sale ends on December 23rd so don’t miss out!